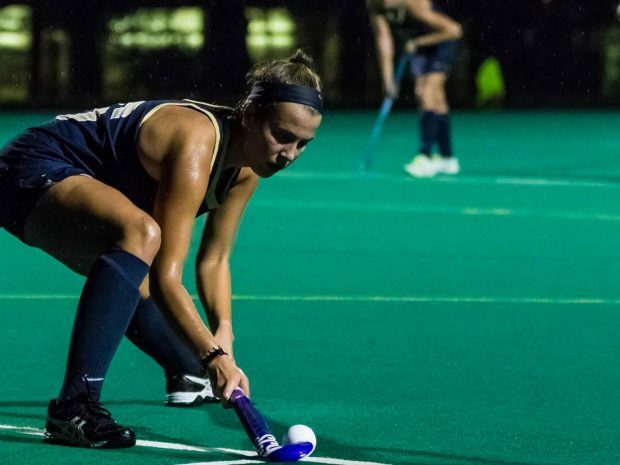 After splitting their last two games the previous week, the Trinity field hockey team suffered a narrow loss to the Hamilton Continentals. This loss signaled the second loss of the season, but more importantly their second conference loss. Similar to last week’s Williams loss, the match against Hamilton was a tight contention and the only thing that separated the two teams was a single goal. The Bantams traveled up to Clinton, NY to face off against the undefeated Continentals (3-0), and fought a hard-battled match. After splitting their last two games the previous week, the Trinity field hockey team suffered a narrow loss to the Hamilton Continentals. This loss signaled the second loss of the season, but more importantly their second conference loss. Similar to last week’s Williams loss, the match against Hamilton was a tight contention and the only thing that separated the two teams was a single goal. The Bantams traveled up to Clinton, NY to face off against the undefeated Continentals (3-0), and fought a hard-battled match. The Bantams fell behind early, trailing by two goals in the 10th minute of play. Leading up to both goals, Hamilton had been applying constant pressure, which was ultimately rewarded in their early lead. The following 10 minutes were tightly contested, with both teams seeing great opportunities. The Bantams eventually broke through, cutting the lead in half, when senior captain Allison Slowe (Medfield, MA) played an excellent ball to sophomore forward Kendall Brown (Greenwich, CT), who showed no hesitations in tucking the ball in the back of the net. This goal was scored in the 23rd minute and was the last goal seen in the first half, making the score a tightly contested 2-1 in favor of the home team Continentals. The second half was a tight affair, as the trends of the first half continued. The scoring momentum of the first half stuck with the Bantams, as they riffled shot after shot at the Hamilton goalie, who answered strongly in denying each opportunity. Shortly after, Hamilton was able to flip the field, and score only seven minutes into the half, when Hamilton was able to follow up her initial saved shot with a rebound put back. Immediately after conceding, Trinity went on the offensive, and rattled off a critical goal, shrinking the lead again to one. The goal came only one minute later, thanks to the great effort by senior captain Chandler Solimine (Pelham, NY). Momentum for the Bantams seemed to die after, as they were unable to overcome pressure to register a shot on net for the remainder of the game. The Bantam’s next match is on the road against Keene State on Thursday at 6:30 p.m. The next home match for the Bantams is this Saturday against the Colby College Mules. Be sure to come out and support your field hockey Bantams!